With Halloween fast approaching the kids will be looking for SPOOKY snacks. Spooky snacks don’t necessarily need to be unhealthy. They can be SCARILY healthy instead. Although Halloween isn’t something we celebrate in our house, it is an excuse for me to get creative and try out new foods and practice my food presentation skills. So, I've created some quick and simple to cook Mummy Pizzas with CREEPY coriander eyes. These are so much fun to make – especially with the kids. The pizzas don’t need to be neat either, in fact, the rougher the better to create the bandage look on the Mummy’s face. 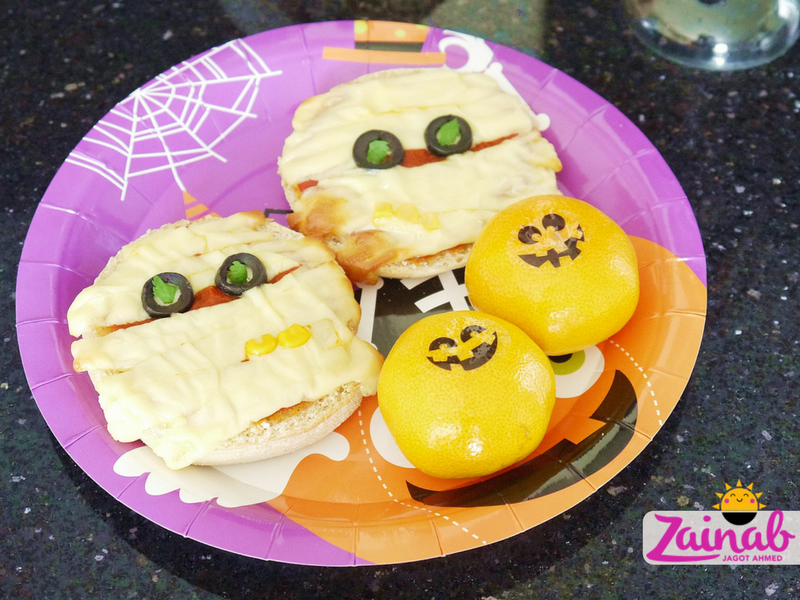 Give these a try this Halloween – the muffin makes a beautifully soft 'pizza' base and they really are DELICIOUS (and cute)! Heat the oil in a frying pan and stir-fry the garlic. When it sizzles, pour in the tomatoes - then add the cumin, coriander, balsamic vinegar and salt (if using). Leave to simmer on medium-low heat allowing the sauce to thicken. Once thickened, remove from the heat and allow to cool. Place the four muffins on a baking tray, spread the sauce evenly over each one, place the cheese in strips (at different angles) across the whole muffin – leaving a space near the top for the eyes and a little space at the bottom for the 'gold teeth' aka - the sweetcorn. Places two sliced black olives at the top of each pizza to create the eyes, and sweetcorn near the mouth area for the gold teeth. Once cooked remove from the oven and break the coriander leaves into small pieces. Place them inside the two black olive eyes. Do this for all the pizzas to create green zombie-like eyes. Serve to kids warm alongside spooky satsumas.